Vans Off The Wall and Shout! 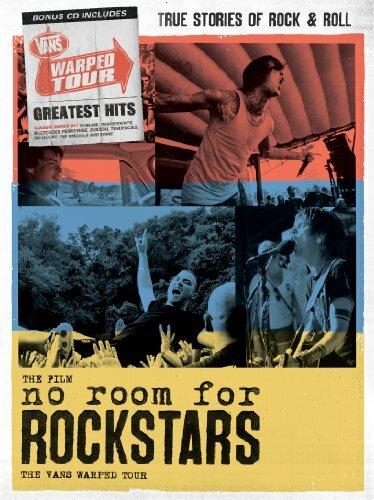 Factory's DVD release of NO ROOM FOR ROCKSTARS, the Vans Warped Tour movie, will be available in stores May 15th with a suggest retail price of $16.98. The DVD also includes a bonus CD: The Vans Warped Tour Greatest Hits, which features classic songs by bands who have performed on the tour throughout the years, including Sublime, Descendents, Buzzcocks, Pennywise, Suicidal Tendencies, No Doubt and more. No Room For Rockstars depicts the true stories of modern era rock and roll from the kids in the van playing parking lots hoping to be discovered, to the veteran stage manager whose life was saved by the tour, to the musician who crosses over to mainstream success while on the road. Directed by Parris Patton (Amazing Journey: The Story of the WHO) and produced by the team that brought you Dogtown & Z-boys, Stacy Peralta and Agi Orsi, No Room For Rockstars is a feature documentary culled from more than 300 hours of film shot on the 2010 Vans Warped Tour. The film showcases music from featured acts such as Suicide Silence, Never Shout Never, Mike Posner and Forever Came Calling, as well as Warped favorites Pennywise, Bouncing Souls and Sum 41. For 17 years, the Vans Warped Tour has been a punk rock juggernaut, a misfit circus crisscrossing North America every summer as a wandering minstrel show for youth culture. Embracing a powerful, unifying ethic created by its founder Kevin Lyman, the Vans Warped Tour has grown and prospered as the music industry itself imploded and continues to sift through the rubble in search of a new way forward. Along the way, Warped has provided a launching pad for a dizzying array of talent, from Green Day and Blink 182 to Ice-T, Eminem and No Doubt, along with perennial punk legends such as Pennywise, All, Bouncing Souls and Bad Religion. Bonus Material Specifics * Over 90 minutes of bonus material including performances and interview footage featuring Bouncing Souls, Bring Me The Horizon, Andrew W.K. and more.